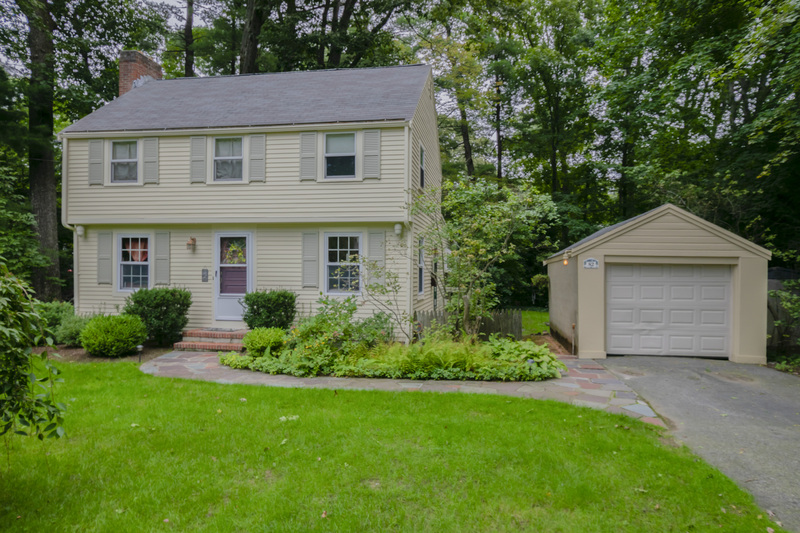 You’ll love coming home to this immaculate Colonial perfectly set in a popular Lexington neighborhood, tucked away behind a tall fence for added privacy. Perennial plantings, mature trees, and a flagstone pathway deliver curb appeal galore and a welcoming invitation to the front entry. Gleaming hardwood floors and a freshly painted, neutral color palette span the home’s easy-flow floor plan. Natural light streams into the spacious, open concept formal living and dining rooms as the newly-refinished shining hardwood floors span, offering the perfect space for both comfortable living and entertaining. A wood-burning fireplace, with a stylish white mantel and surround, provides a cozy place to gather on chilly nights. Celebrate special occasions in the formal dining room with shining hardwood floors and a built-in china cabinet to showcase treasured dinnerware. Prepare to be amazed as the living room flows through a cased opening to the open concept kitchen and family room. Imagine sharing laughter and conversation with guests in this wonderful space perfect for effortless entertaining. The chef ’s culinary skills are guaranteed to shine in the updated kitchen full of modern flair with granite counters, a breakfast bar peninsula with a prep sink, stylish wood cabinetry, a skylight, brushed nickel hardware, gas cooking, recessed lighting, and modern pendant lighting. The kitchen transitions seamlessly into the family room as a sliding glass door opens the home to even more light while offering delightful views of the backyard and beyond. The slider provides a great connection to the spacious deck where many summer days will be spent relaxing and entertaining. Mature trees and perennial plantings surround the backyard for added beauty and privacy. Full bathroom with a shower completes the first level. A centrally located staircase leads to the second level where the light-filled master bedroom, two more family bedrooms, and another full bathroom await. Sunlight streams through the sunny windows of the generous bedrooms with newly refinished hardwood floors and ample closet space. One of the family bedrooms offers a cathedral ceiling and a ladder stretching to a delightful loft space above with a skylight, perfect as a private retreat or as a cozy spot to curl up with a good book. The second level bathroom is tastefully done in neutral tones featuring a tiled tub with shower, skylight, and a ceramic tile floor. An attic space adjoining the bedroom loft offers additional storage. The lower level continues to deliver with a finished room perfect for use as a second family room, playroom, exercise space, or whatever you desire with brand new, plush carpeting and recessed lighting. The laundry room is spacious and efficient with a utility sink and brand new flooring. The lower level also offers abundant storage space, including a large closet with shelving, to efficiently organize all your family’s hobbies and activities. Perfectly situated to enjoy all that Lexington has to offer, this home is convenient to the town center and a short distance to Route 2, public transportation, and the Minuteman Bike Path. The Old Res beach area with swimming during summer months and ice skating in winter is only a short distance away. Be a part of a highly renowned school system and immerse yourself in the town’s rich history. What a wonderful opportunity to live in one of Lexington’s finest neighborhoods.